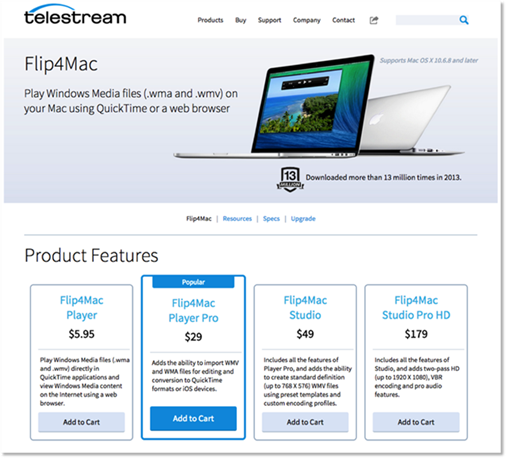 Telestream sells software that enables Mac users to play Windows Media Files (.wma and .wmv) on their Mac using QuickTime or a web browser. Microsoft notified Telestream that they were removing the link from their website to the product. Since this link provided traffic to their product, and subsequent revenue, Telestream wanted to quantify the impact of the link removal. They reached out to Blast Analytics & Marketing to devise a forecasting solution that would provide a projection of the estimated loss in monthly revenue from this change. 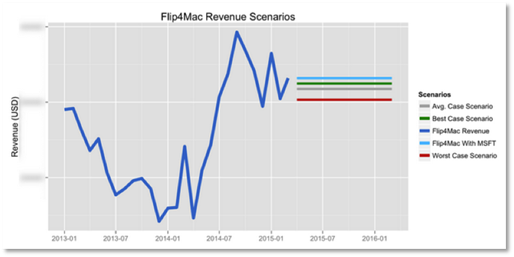 The first step was to understand if the backend revenue for Flip4Mac matched the revenue reporting numbers in Google Analytics. Once it was confirmed that the Google Analytics data was correct, Blast broke down the revenue for Flip4Mac into two components: revenue from the link, and all other revenue. Blast used the statistical package R, which is a programming language and software environment for statistical computing and graphics, to forecast the revenue loss according to the outlined scenarios. By manipulating the Google Analytics data within R, Blast was able to determine the impact the link removal would have upon overall monthly revenue. 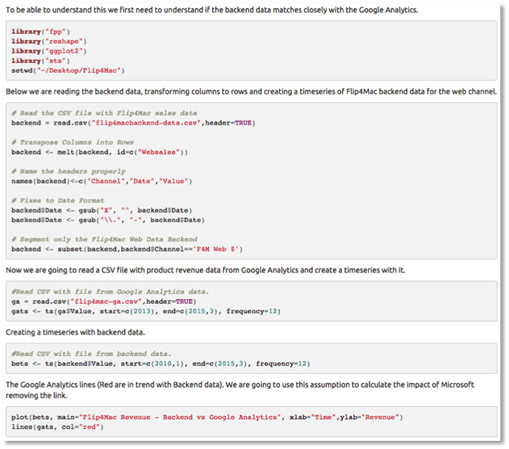 an R markdown file which would allow Telestream to see the methodology and reproduce the analysis, if necessary. With a forecasted loss of revenue between 2% and 8%, Blast Analytics & Marketing provided Telestream with recommendations that helped address the forecasted loss of revenue, limiting its impact.